Relocated to it's new home in North Pattaya after 25 years on the corner of Soi BJ. 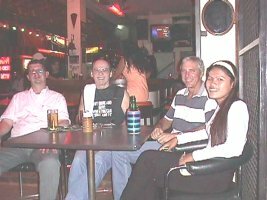 We are the 'oldest' bar in Pattaya. Established on July 4th, 1974. The bar has been under the same American management for the past 25 years. Prices on all drinks have been unchanged for over five years, even after the July 97' devaluation of the baht. Rock and Roll from the 60's and 70's is still played today, with the occasional new sound in music thrown in for the younger generation. Considered to be the Home of Military Special Operations, the bar caters to a variety of U.S. Military personnel representing the Navy, Army, Marines, and Air Force. Oh yes, tourist are also welcome! Open everyday from 3pm-till-3am, closing only when the local constabulary enforces closure on all bars during National holidays or elections. Otherwise, the party never stops, come on in! Want to know more about Pattaya City Beach Resort ? Copyright � 1998 PattayaCity.com. All Rights Reserved. Please do not take any part of this Site or link to it without written permission.